I've just brought this by chance from a new neighbour as her son owned it and now works in the Navy and she wanted it off her driveway. She did have permission from her son to sell! I understand it to be a 1998 Subaru Impreza Terzo that is limited edition? My first question is there is no CAT and it's very loud! If I put a CAT on will it make much different to how loud it is and the performance of it? Second question is it worth spending the money on it? The body work isn't great? Regarding the noise, the cat will make a little bit of difference, but the biggest difference will come from changing the backbox (the last section of the exhaust). There's also a middle section that usually has a silencer in it, which will make it quieter still. Not sure what to do about the body work, and if its worth spending money on... it does look like almost all the panels except maybe the roof need paint? Check the rear arches (and in the wheel-well), and also check on the inside of the car around the rear struts. There might be quite a bit of rust hiding there, if unlucky. If its quite loud, chances are its decatted and may be with 3" pipework. A cat will quieten the system down but its normal to remap for the addition/removal of cats which begs the question of has it been remapped already? If not, it should run safer with the cat. In my opinion, special editions are only worth the upper end of the market value if they are clean, original and well maintained. Mileage at the average would be more attractive to me than uber low but thats just my opinion. I cant comment on maintenance but from the pic and what you're saying its got non standard wheels, exhaust and a rear spoiler. Value of the car is more down to your plans. If you're in to make a pound you'd ideally be looking to standardise it but if you're planning keeping and runing it, thats less of an issue. Edit: Henrik above types quicker than me and is probably right about the back box. If its just that and its a 2.5" one its easy to get a hold of a quieter back box. Lots available second hand or new. Last edited by LewisScoob; 11 April 2019 at 08:57 AM. If its just that and its a 2.5" one its easy to get a hold of a quieter back box. Lots available second hand or new. Good points about the decat vs remap! I had a 2.5" exhaust for many years, and even my "quiet" 3" exhaust is significantly louder. Perhaps worth checking the pipework diameter and then making a decision? 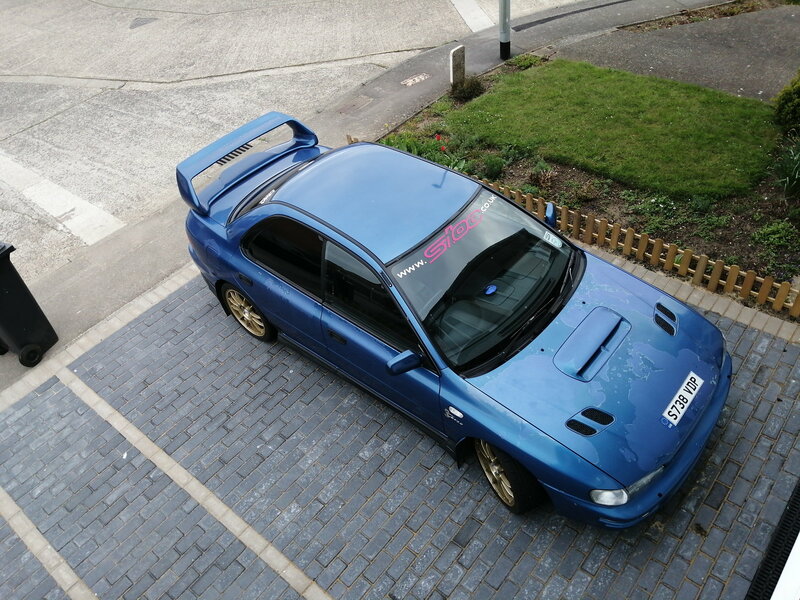 I *think* it should fit a classic impreza as well, except the single middle hanger is the wrong way around, but tbh I've ran a classic backbox on my new age subaru with no issues. Unfortunately, because it's already got an aftermarket exhaust system, the system on the car may have joints in different places to a standard system. I have decided to keep the car for myself after driving it for the last week and loving it! It's booked in for cambelt, water pump, gaskets and oil and filters along with a new CAT. Next month it's then going in for paint. Full respray and then the WRX stickers. The cost is coming in at around 3k. I paid 1250 for the car as it stood. The milage is 35k on the new engine it had in 2006 according to the paperwork I have with it. So it will owe with around 4.5k when it's finished. I'll be happy to pop up photos throughout its changes! "Full respray and then the WRX stickers". - do you mean WRC stickers as the photo? If you're going to the expense of the full respray why not keep it as standard as possible with a few tasteful mods, e.g. the wheels? Although the Terzo isn't an especially sought after limited edition they are quite rare (originally 333 made) and it would attract more interest as a standard-looking car. Also stickered-up Impreza's are a bit 'last year'! But if that's your thing then go for it - great to see another Classic saved, rather than broken for parts! I agree with keeping as much of the outside standard particularly as you are going to the expense of a full respray. What colour are you going to paint it? O2C WR Blue as in the pic with he stickers or 74F Sonic blue as it was? Yeah I'd give the stickers a miss. Looking at Google there is only 60 Terzo's still on the road! I don't understand why there not more sort after or followed as some other limited editions as I would guess with only 333 produced there one of the smallest amount of limited editions ever made? The Terzo as standard wasn't that quick, it didn't look that good either in my opinion so answering my own question lol maybe there not that sort? I think putting on the WRC stickers will help it stand out? Tasteful of course. Subject to the rust not being too bad I think you got a good deal. Paul I hear you with keeping it original being a limited edition, but by all accounts this limited edition wasn't that desirable in the first place lol. So I think it would cost the same putting it back to original and not worth any more than a run of the mill Subaru? So I agree with a front splitter bring the nose down a little and make the front look deeper if you know what I mean? It has a front coolant rad/system on the front meaning the original fog lights didn't fit anymore so I've purchased the covers to adapt and cover the nasty holes! Sides and rear trim definitely treated and coloured coded. Keep the big booty more sticker room lol. I'm getting wheels refurbished in gold still and then place stickers on one at a time so it doesn't become to busy? A little more advice please the car pulls slightly to the right on occasions which I know doesn't sound right, so I took it for a 4 wheel alignment check to be told it couldn't be done as either the front or rear passenger wheel the wrong camber and can not be adjusted ? They said take it to someone who knows these cars! What does this mean? You mean a front mounted intercooler? Like this in the engine bay with pipes leading to the intake and from the turbo? Yes sorry I'm still learning this stuff. Is there a benefit for this cooling system? No need for apologies, just checking. There's the benefit of cooler inlet temperatures if you're doing trackdays or sustained high speed. The standard intercooler is up top at the back of the engine bay (Top Mount Intercooler or TMIC). Do you know if the car has been remapped at all? I personally think you have it all wrong, you got to remember that a few years ago (could be longer, I'm getting old lol) you couldn't give these cars away. They had next to no value so even the most rare cars were getting broken. The car is worth more than you think. Just check the paint code if you are going original, it should be on the panel in the engine bay with the vin number. When the car was released it was considered quick and nothing in its price range new would have been quicker really. Last edited by NOSSY_89; 16 April 2019 at 08:58 AM. I don't know mate if the car has been re-mapped? It was dropped off at East Kent Subaru yesterday to have a new CAT fitted to help with the noise and more importantly getting through an MOT lol. They are also changing cambelt/water pump, engine gaskets, cone ramair air filter and service. I've found a receipt within all its history of a new engine being dropped into it in 2006, but doesn't say what engine and I do not have a clue of how to find out? What I'm will say the piece of crap they gave me as a courtesy car is making me miss it more! Hi and thank you. I wasn't sure about buying it and what to do with it? I've been told it's the sonic blue and that was the best colour they did? I was thinking about going a darker blue, but been advised by many to keep the original blue. I'm hoping once the cost of the car and work completed considered I won't be down! I will post a few pictures once it starts taking shape. I realise you are stuck between a rock and a hard place having to fit a cat for MoT but running a cat in a system thats been mapped for decat and vice versa is not good for the engine. If I were in your shoes, as soon as the car is back from the MoT, get it to a garage with rollers that can run the car to check the map and consequently the engine is safe. Because your car is a V3-V4, I don't think there's an option for remapping the original ECU (await correction from others) and so an aftermarket ECU would have to be fitted inorder to safely run minus the cat and with the FMIC. It may have been this reason it needed a new engine in the first place. Thank you for the advice and I have asked the garage to check for me after the cat has been fitted. Cat question: DP sports cat or DP and centre sport cat? Another cat thread - SHOOT THE CAT!!! 3" de-cat downpipe + oem STi cat-back ??? Cat 1 or not Cat 1?